These muffins are great! Who says that things that are healthy have to taste bad? Try making a batch of these, your kids will love em! Preheat oven to 350 degrees. While oven is heating, prepare topping by mixing together the first 5 ingredients. Cut in 1 Tablespoon butter until it resembles small crumbs. Set aside. 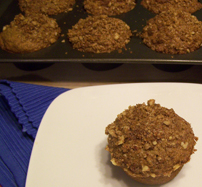 For muffins, in a large bowl, mix together the flour, whole wheat flour, flax seed, baking soda, baking powder and salt. Stir to combine. In a mixing bowl mix together the sugar, egg, banana, molasses, vanilla and applesauce. Stir wet ingredients into flour mixture by hand until just combined. Do not over mix or muffins will be chewy. Pour batter into muffin pan sprayed with cooking spray or lined with paper liners. Fill each space two thirds full. Top each muffin with the topping mixture and place in oven to bake. Bake for 15 -20 minutes or until toothpick inserted in the center of muffin comes out clean. Remove to wire rack to cool.